Our BB-8 Bruschetta recipe is a Paid Promotion for Lucasfilm’s Star Wars: The Last Jedi. We promised you two recipes for Star Wars: The Last Jedi, so here is our second one! Our typical style for recipes is a more literal type of recipe. However, similar to our Crait-Cakes, we have another fun recipe that is more design based. This time we are celebrating one of our favorite characters of the film. Our BB-8 Bruschetta is sure to impress not only the kiddos but adults as well! But let’s get to what you came for, the food! Breakfast meets bruschetta with this BB-8 Bruschetta! In this recipe, BB stands for Bagel Bruschetta. These tasty little treats combine the best parts of an everything bagel, veggies, and everyone’s favorite BB Series Astromech Droid! If everything bagel seasoning isn’t your thing, you can easily switch it out for black sesame seeds. 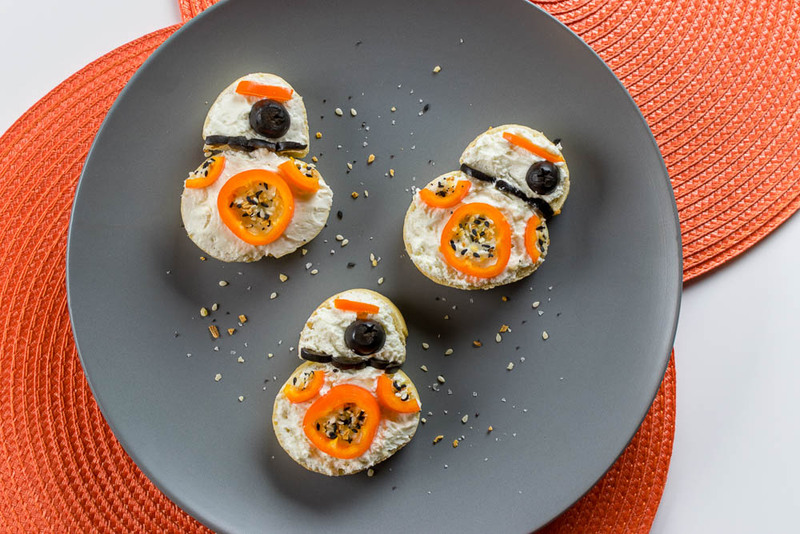 We hope you love these adorable BB-8 Bruschetta! Star Wars: The Last Jedi is out now on Digital HD and Blu-ray! Be sure to check out our other recipe for Crait-Cakes! Vertically slice your baguette into ¾ inch slices. Slice mini bell peppers into thin rings for BB-8’s orange rings. Cut a few of the rings into halves or thirds for the half rings and for the top of BB-8’s head. Slice half of the olives in half both widthwise and lengthwise for the black link on the bottom of BB-8’s head. To construct the base, cut one slice of baguette in half and using a toothpick connect the half to a full slice. Repeat until you’ve created the desired amount of bruschetta. 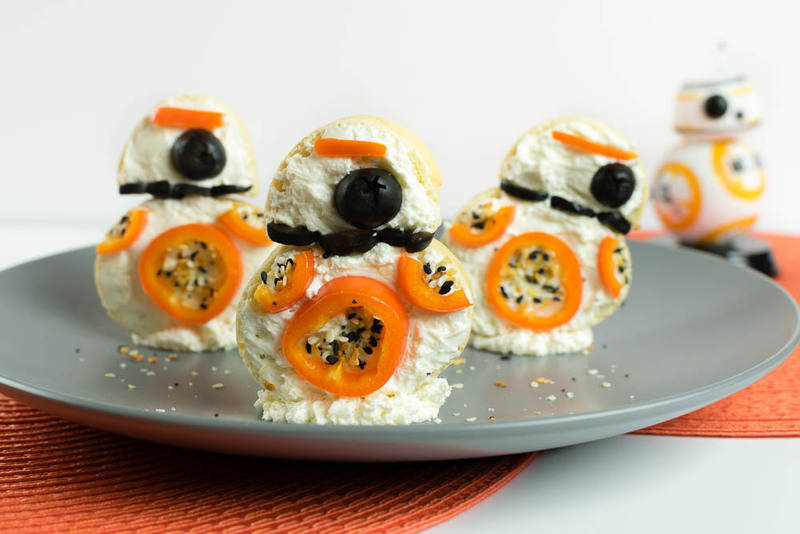 Top each BB-8 with a thin layer of cream cheese. For the body: place a full mini bell pepper ring in the center and a partial ring on both sides near the top. Fill the rings with a pinch of everything bagel seasoning. For the head: Place a sliver of mini bell pepper at the top. Next line the bottom of his head with the sliced black olives. Place a whole olive slice for the eye (we used the end pieces so the cream cheese doesn’t show). *This is a Paid Promotion for Lucasfilm’s Star Wars: The Last Jedi; We were also provided with an advanced copy for research purposes. All opinions are wholly our own. View our Disclosure Policy for more info. 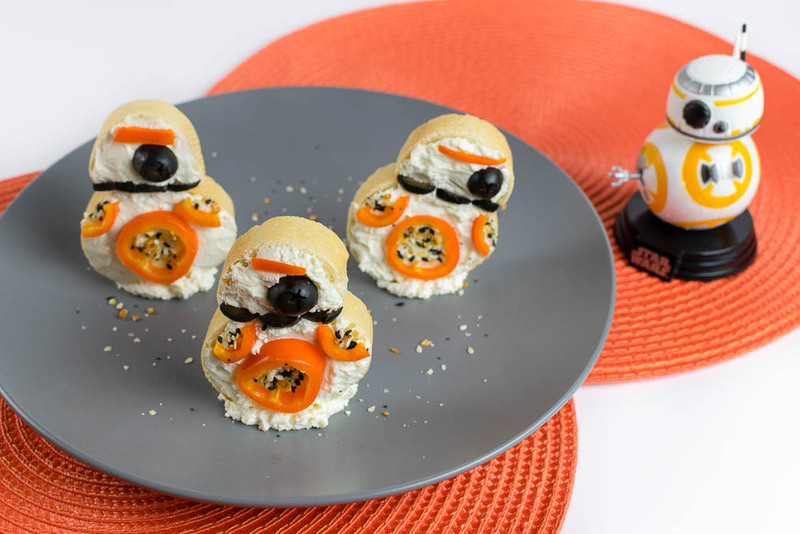 My kids will go wild for these BB8 inspired bruschetta. They will have fun making them with me!